These Creamed Spinach Stuffed Keto Pork Chops are amazing! They’re a flavorful one-pan meal that takes only 30 minutes to get on the table, and in true keto style, they’re super low in carbs. This keto pork chops recipe produces moist, fork-tender pork chops that are bursting with flavor. You’ll stuff each pork chop with a creamy mixture of wilted spinach, sour cream, and cream cheese before browning the pork chops in olive oil. Then you’ll make a sauce out of chicken broth and sour cream that will be spooned over the stuffed pork chops before serving. Pork chops make for a wonderful easy dinner choice, but if they’re not cooked properly, the results are less than appealing. If they’re overcooked or cooked without enough moisture, the end result can be chewy and tough — not exactly an appetizing dinner choice. But these pork chops? They don’t stand a chance at drying out! 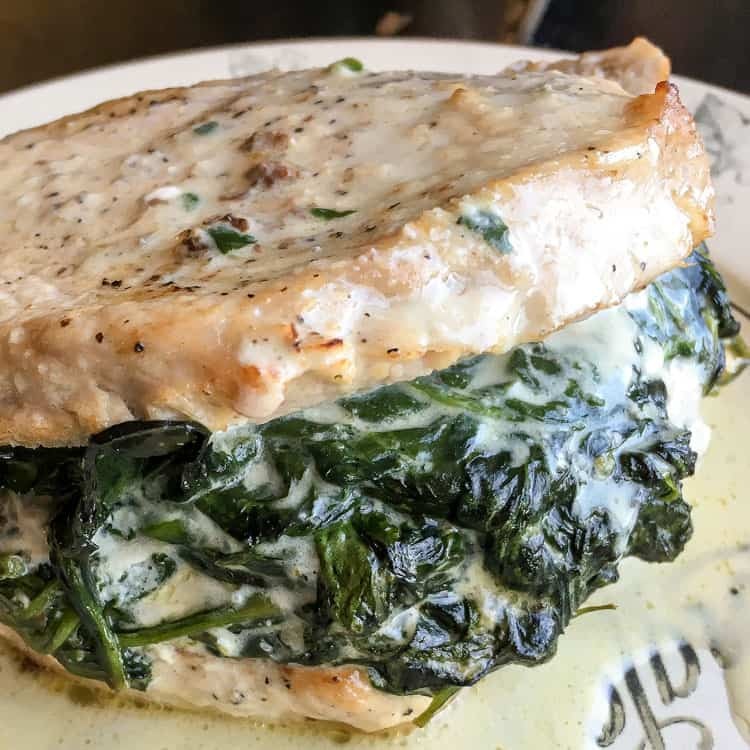 Ready in only 30 minutes, creamed Spinach Stuffed Keto Pork chops are the perfect choice for those nights when you barely have time for takeout… but you definitely want something healthier. Even better, they make for a great family meal, even for those family members who aren’t on the keto diet. Just serve them a high-carb side or two and they’ll be good to go! 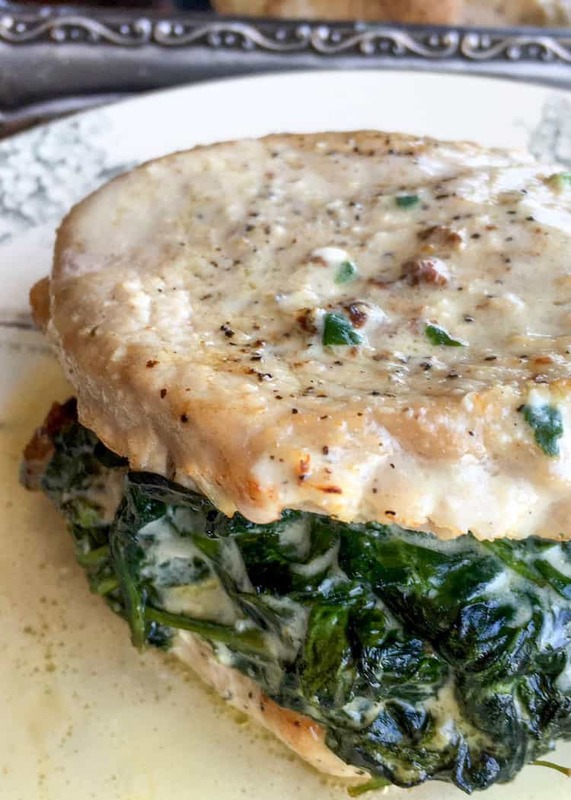 How Many Servings are in Creamed Spinach Stuffed Keto Pork Chops? You’ll use four boneless pork chops in this recipe, which will give you four servings. If you’re still feeling a bit hungry, load up on additional sides (see the “What to Serve with Creamed Spinach Stuffed Keto Pork Chops” section) or have a low-carb dessert like decaf coffee with cream and your low-carb sweetener of choice. How Many Carbs are in Creamed Spinach Stuffed Keto Pork Chops? This easy keto recipe is very low in carbs! Each serving contains only 6.7 grams of carbs, 1.9 grams of which is fiber. That gives each serving a net carb count of only 4.8 grams. A simple green vegetable side, like steamed broccoli or asparagus. Even though these pork chops come with plenty of greens, a little extra never hurt. Don’t be afraid to add some butter or coconut oil to your veggies — remember, fat is a good thing on the keto diet! A side salad, like this Keto Salad with Homemade Blue Cheese Dressing. It’s a tasty wedge salad recipe topped with bacon, hardboiled eggs, avocado, and a to-die-for blue cheese dressing. Cauliflower rice, which you can learn how to make from this recipe. Cauliflower “rice” is a healthier, low-carb alternative to traditional rice. You can add butter or ghee to your cauliflower rice before serving it for an additional boost of fat. You will love these stuffed keto pork chops! With a sharp knife, cut each pork chop along one side to form a pocket. Be careful not to cut through the entire pork chop. Season each side with salt and pepper to taste. Set aside. In a large, high-sided skillet over medium heat, heat 1 tablespoon olive oil and garlic. Cook until the garlic turns golden brown and fragrant (approximately 2-3 minutes). To the skillet, add sour cream and 3 oz of the cream cheese. Stir until the spinach is coated and the cheese has completely melted. Season with salt and pepper to taste. Remove from heat. Let the mixture cool for a few minutes before stuffing each pork chop with an equal amount of the mixture. Make sure to use all of the mixture. Over medium-high heat in the same skillet, heat 1 tablespoon olive oil. Add the pork chops to the hot skillet and cook for 3-4 minutes on each side, or until the pork is sufficiently cooked (browned and cooked through). Remove the pork chops from the skillet, transfer to a serving dish or platter, and then cover to keep warm. Set aside. To the skillet over medium heat, add chicken broth and remainder of cream cheese. Scrape the brown bits from the bottom of the pan while stirring to ensure the cream cheese is fully incorporated. Continue cooking the sauce until it is reduced by one half, which will take about 6-8 minutes. Remove from heat. If desired, season with salt and pepper to taste. Serve by spooning some of the sauce over each stuffed keto pork chop.